Major national milestones have occurred with the recent passing of Neil Armstrong, the first man to step on the Moon, and this month’s 40th Anniversary of Apollo 17, America’s last mission of exploration to that small planet. They provide an opportunity to examine how great ventures play a strategic role in the growth and survival of the United States. At critical times, America’s national leadership, including Congress under its treaty and funding powers, has actively recognized the strategic importance to the “common Defence” of major geographic expansion, exploration or technological development. The 1803 purchase of the Louisiana Territory from France, initiated by President Thomas Jefferson, constituted the first of these fortunate undertakings by a new nation. Jefferson, a scientist himself, dispatched the Corps of Discovery Expedition under the command of Meriwether Lewis and William Clark to explore these new holdings. In addition to thwarting the ambitions of other global powers, this exploration began the assimilation of Western resources and opportunities into the future of the country. President James Polk and Congress followed Jefferson’s lead with the 1845 annexation of Texas and the 1846-48 acquisitions of California and the New Mexico and Oregon Territories. Polk’s remarkable accomplishments in a single term effectively completed the geographic definition of what would become the 48 contiguous States of the United States of America. The final southern boundary in Arizona and New Mexico came soon after with the Gadsden Purchase in 1853-54 under President Franklin Pierce. The early exploration of these rich lands fell to the engineers and scientists of the Army Corps of Topographical Engineers. Attached to Army expeditions traveling through the American West and Southwest, explorers such as John C. Fremont and William H. Emory documented the natural resource and agricultural value of Polk’s decisions. All Americans hoping to improve their lives and those of their families now had more opportunities to do so through settlement and economic growth. Then, in the midst of the challenge of preserving the Union, President Abraham Lincoln showed Americans that he also understood the strategic importance of national expansion and development. In 1862, Lincoln initiated the building of the Transcontinental Railroad and the accompanying transcontinental telegraph, adding geographic, economic and political strength to the Northern cause. As Lincoln originally intended, the Golden Spike that formally joined the Central and Union Pacific Railroads forever tied together the culture, economics, and agricultural and mineral resources of the country. Following Lincoln’s assassination and before the completion of the Transcontinental Railroad, President Andrew Johnson supported Lincoln’s Secretary of State, William Seward, in the purchase of Alaska from Russia in 1867. Seward’s opportunistic foresight has long paid dividends both in natural resources and strategic defense. As in the case of the Transcontinental Railroad, the necessities of national defense and the expansion of trade and commerce led President Theodore Roosevelt to take actions that led to the construction of the Panama Canal. Even though the Canal did not directly involve the continental United States, Roosevelt had recognized the strategic importance of moving naval units and commercial shipping quickly between the Atlantic and Pacific Oceans. As the demands of two World Wars demonstrated, this clairvoyance paid great dividends in preserving democracy throughout the globe. It also stimulated the development of many new technological capabilities, such as large earth-moving machines and electric motors that contributed to the growth of the American economy and the wellbeing of people throughout the world. In the 1950s, the oceans again drew the attention of Presidents and the Congress. Harry S. Truman and Dwight D. Eisenhower, with congressional acceptance of their recommendations, began and expanded the Nuclear Navy starting with the USS Nautilus. These initiatives recognized the potential of nuclear submarines and their missiles, hidden in the vastness of the oceans, to deter the aggressive ambitions of the Soviet Union. Finally, also in the post-World War period, national security drove America’s most recent expansion, this time away from the global confines of Earth and into space. 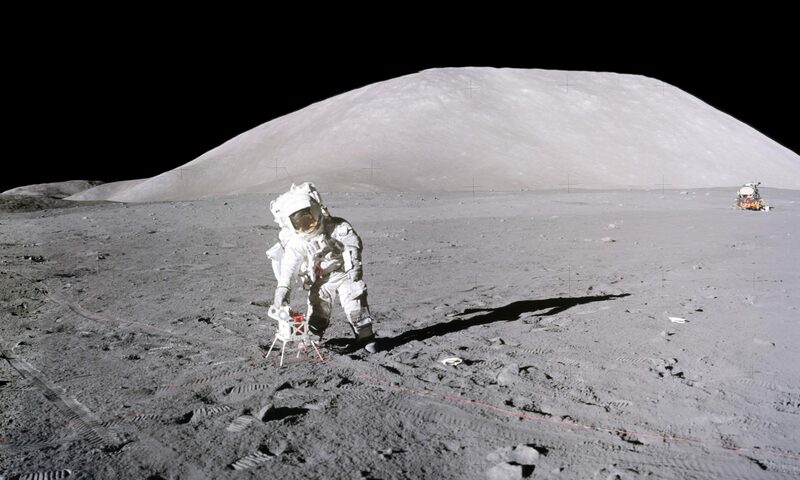 The six landings on the Moon in the 1960s and 70s grew out of the realization by both President Eisenhower and President John F. Kennedy that space would be a critical arena of Cold War competition between freedom and socialism. A year and a half before President Kennedy would set the Nation on a course to the Moon, Eisenhower directed NASA to begin the development of what became the Saturn V Moon rocket. Without a jumpstart on development of the Saturn V, my generation could not have met Kennedy’s goal of “landing a man on the Moon and returning him safely to Earth” before the end of the decade of the 1960s. Such a delay would have emboldened the Soviet Union to continue to press forward with its own Moon landing program. Critical threats coincided with the initiatives taken by American leaders through the centuries. No less critical national and international threats exist today. The current strategic interests of the United States require its political leadership to recognize the imperative of regaining the lead in deep space exploration if American global influence is to remain relevant here on Earth. Deep space exists as the continuing geographic frontier for Americans and, indeed for humankind.